At Vitaphysical we work to relieve pain for those who are plagued by aches and pains of all kinds, restoring movement and function. From our massage and osteopathy clinic close to Ryhope, we deliver a comprehensive range of treatments, helping patients become happier and healthier. Vitaphysical first opened in 2007 and was originally named Sunderland Back Pain Centre. Responding to customer feedback and requests, founders osteopath Jason and masseuse Bronyia expanded the team and service offering to incorporate treatments for a wide range of conditions, from chronic everyday problems through to treatment for injuries. Our additional massage therapists Emma and Kirsty provide options for relaxation and pain relief including deep tissue massage, Thai massage and specialist sports therapy. We still host a back pain centre in addition to treating neck pain and frozen shoulder. Our practitioners also tackle posture problems, sciatica and a host of other painful conditions. 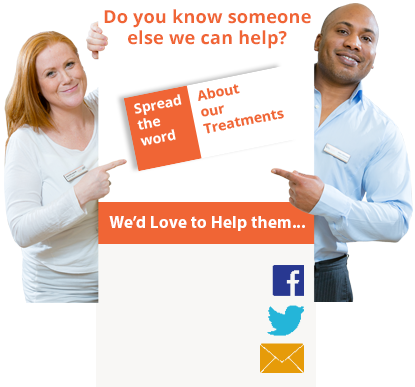 Our what we treat page details the conditions we tackle on a day-to-day basis, freeing patients from pain. To help you identify the course of treatment that will work best for you, we offer a free telephone consultation. Call one of our friendly staff on 0191 565 8886 and we will be happy to guide you through your options and explain what you can expect from your first visit. We’re confident you’ll be satisfied with our service, so we offer a 100% money back guarantee on all courses of treatment and with our downloadable vouchers you can claim a discount on your first visit too. Vitaphysical is located on John Street Sunderland, ten minutes drive from Ryhope along the A1018. The clinic is also just a short walk from Sunderland train station. For further details, visit our how to find us page. We look forward to welcoming you to our centre soon.